The boy's are holding up a AC/DC - Rolling Stones poster that Jeff designed for a AC/DC Rolling Stones combined concert in Germany. In a moment of serendipity, Brain and Jeff both stopped by Williams studio at the same time. William has had the poster hanging in his studio for decades! William and Sister Wendy Beckett in Florence Italy. Firenze Sera da Studio Mio 30 x 40 Oil on Canvas. This painting represents a night view of the Duomo from William's Florence Studio. William out on the Nido di piccione (pigeon's nest) of his Florence studio. Taking a Break, Monteriggioni Complete! 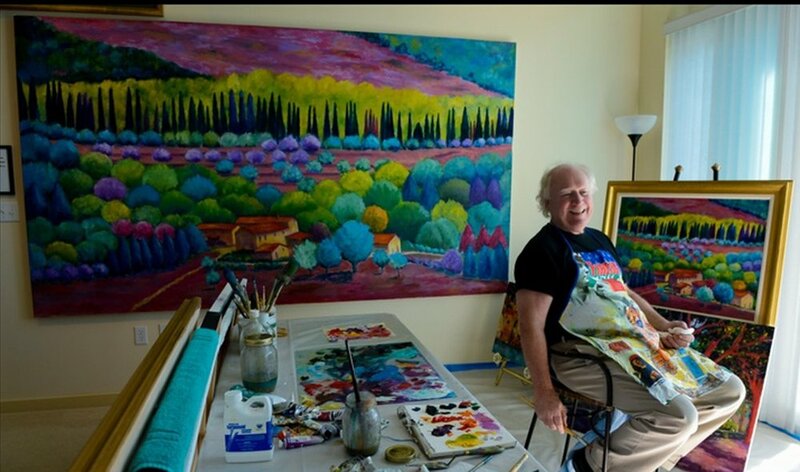 William takes a break after completing a 24"x32" version of his original wall-sized "Monteriggioni 2011", 72"x120".